The emigrant ship Marion struck Troubridge Shoal 29 July. All 350 passengers were landed safely. Most travelled overland to Adelaide, but some were taken off by the tug Yarola. Barque George Home was abandoned 150 miles SSE of Kangaroo Island. With eight feet of water in the hold, she was beginning to break up. The crew took to the boats and were rescued near Cape Jervis. Brig Flying Dutchman grounded on the bar near the Port River. The cargo was salvaged but a subsequent storm destroyed her. Cutter Resource was driven ashore in Rivoli Bay in June, and became a total loss. This was following a successful salvage and repair job after a similar accident in September 1850. Cutter Jane & Emma was wrecked at the Bluff, Encounter Bay in May, with no loss of life. Schooner Jane Lovett was driven ashore near Cape Northumberland in September. The passengers and crew, with the exception of the captain, walked to Portland. The captain was murdered in his bunk by looters. Barque Margaret Brock sailed from Port Adelaide 20 November bound for Melbourne. She struck an offshore reef south of Guichen Bay three days later. Passengers and crew were landed safely, and the ship broke up quickly in a storm soon after. 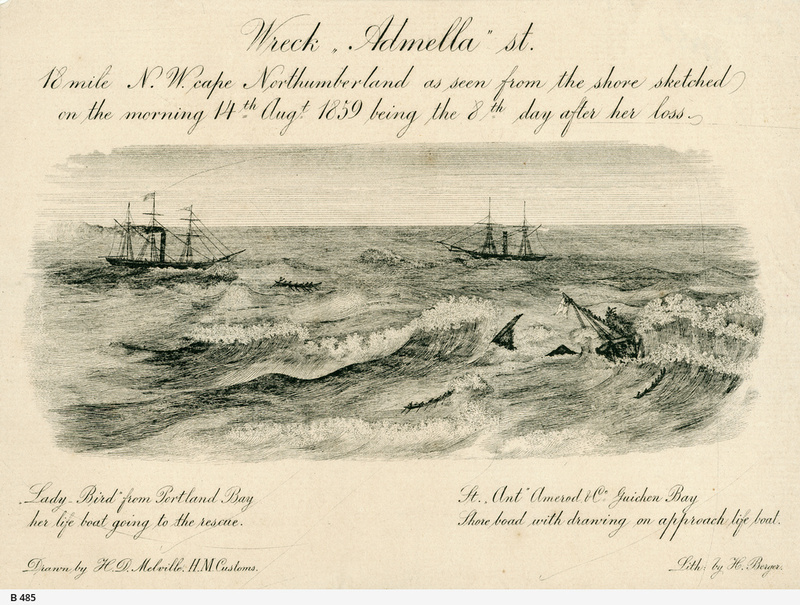 Barque Marie was wrecked in the vicinity of Cape Bridgewater (Victoria) 19 September. There were no survivors. Wreckage was scattered along 30 miles of the south-east coast. Barque Duilius was wrecked at Guichen Bay 15 April. At anchor and loading a cargo of wool, a storm blew up, the anchors parted and the ship was damaged on rocks. She was abandoned, but most of her gear, stores and cargo were saved. Schooner Witness was wrecked on Cape Northumberland 1 May. 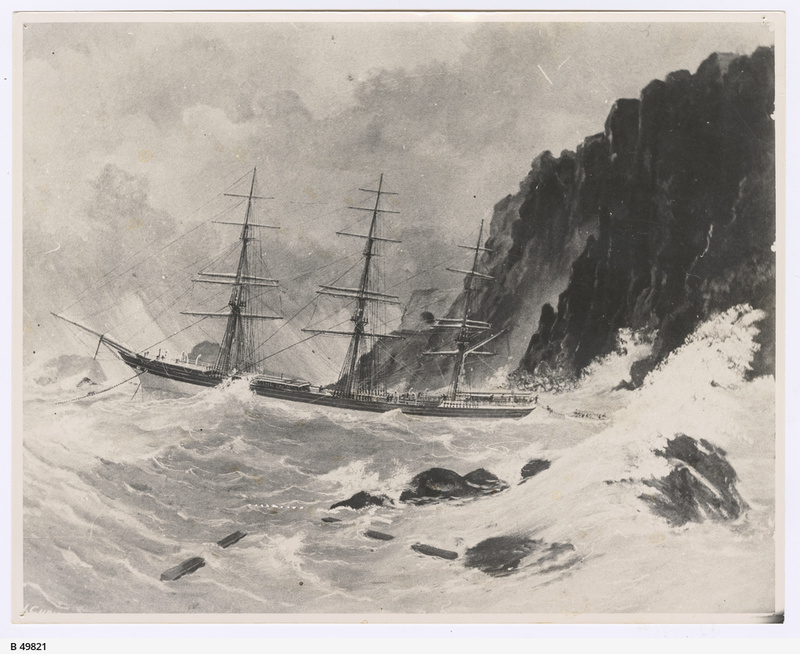 In early July the cutter Midge was wrecked on the rocks near Cape Willoughby lighthouse. Steamship Osmanli was wrecked in D'Estrees Bay, Kangaroo Island 25 November. All crew and passengers landed safely but attempts to salvage the ship were unsuccessful. Schooner Emu loaded 164 bags of wheat at Port Elliot, sailed for Adelaide, but returned when threatening weather moved in. She broke up at her anchorage, all lives lost. Troubridge Shoal claimed its third ship on 23 February, when the brig Charles Carter ran ashore after a voyage from Mauritius. Salvage attempts were thwarted by bad weather in early March. Wooden barque Mozambique en route to Melbourne from London was driven ashore in heavy seas on the Coorong beach 19 August. All passengers and crew landed safely and were taken to Goolwa by a local resident William Low. The sloop O.G. was forced ashore in Yankalilla Bay in May. Cutter Industry was also forced ashore in Yankalilla Bay 18 August. Efforts to refloat her were apparently unsuccessful. 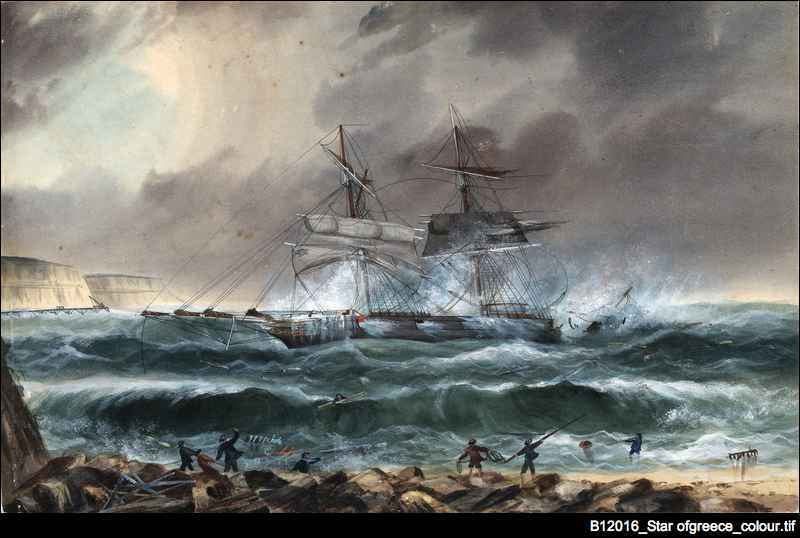 Barque Nene Valley was wrecked at Cape Northumberland 19 October, en route to Portland from London. All crew and passengers were landed safely, but the second mate and three seamen were drowned when their boat capsized following a return to the ship to cut away the mast. The survivors walked to the mouth of the Glenelg River in Victoria, where the captain obtained a horse and rode into Portland to report the loss and fetch help. The schooner or brigantine Sanspariel (or Sans Pareille) was wrecked 30 January on a reef south east of Cape Jervis. No lives were lost. Cutter Joseph Lee Archer was driven onto rocks in Guichen Bay, 9 June, and became a total wreck. Barque Iron Age en route to Portland from Liverpool with a general cargo ran into a reef off Cape Banks 15 February. The crew reached safety. 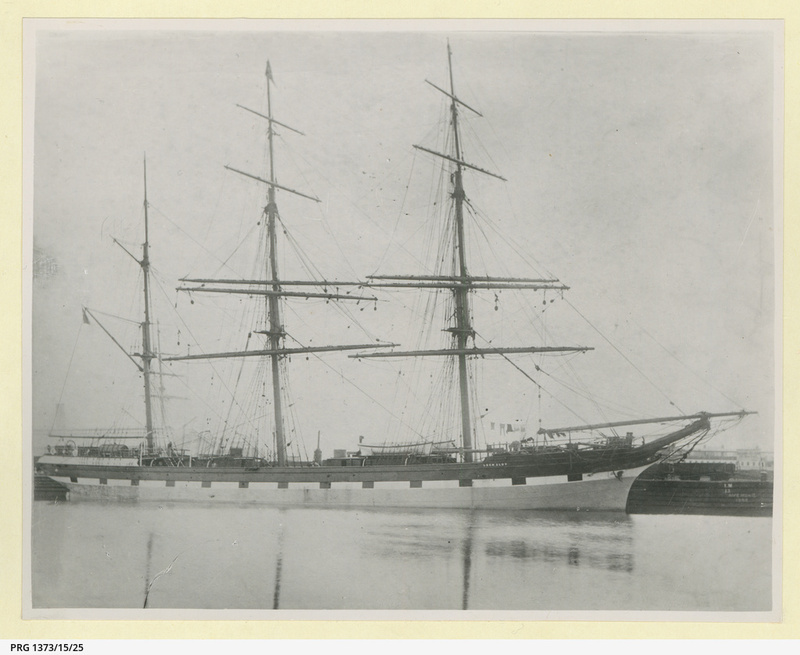 On 13 May the emigrant ship Nashwauk ran aground south of the mouth of the Onkaparinga River. 300 Irish emigrants were landed safely, but storms eventually destroyed the ship. (J. Callen What really happened to the Nashwauk). Ship Varoon en route to Sydney from Manilla, was wrecked 20 miles west of Cape Northumberland late in January. Bodies washed up on the beach at Cape Bridgewater (Victoria) alerted authorities to the wreck. 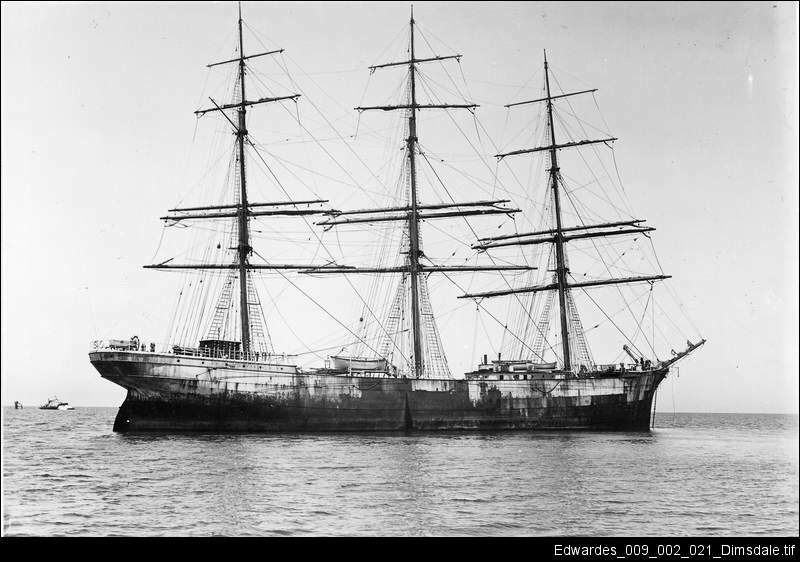 Cutter Maid of the Mill was forced ashore 27 February in a storm near the Onkaparinga River mouth where she became a total wreck. 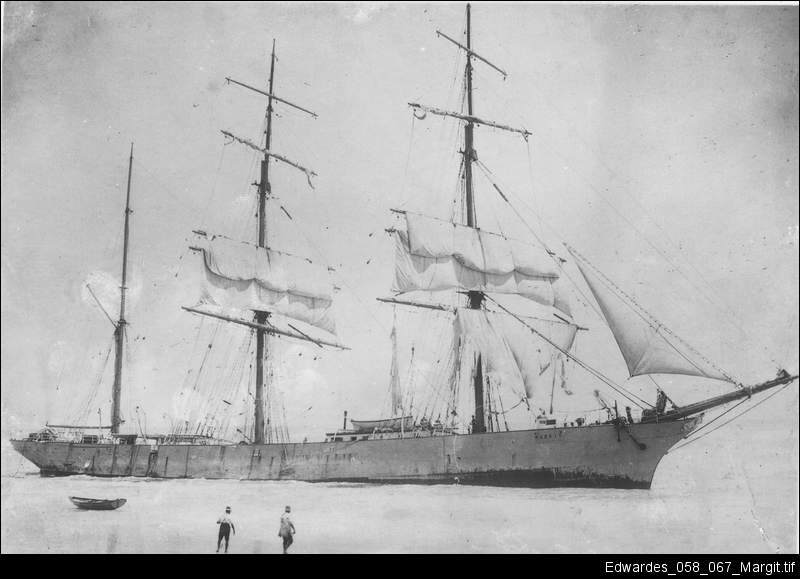 Schooner Commodore, anchored at Port Elliot, parted her anchor during strong winds on 28 February and was destroyed on the rocks adjacent to her moorings. Brigantine Josephine L'Oizeau reached Port Elliot from Adelaide with cargo and passengers for the paddlesteamer Albury at Goolwa. Late in the afternoon of 10 July a strong gale blew up, the ship's anchor parted and she ran ashore. Passengers and crew were landed safely. General Blanco ran onto the Troubridge Shoal on 3 September. There was one casualty, and the ship was successfully salvaged. The brigantine Robert Clive was wrecked just north of the Onkaparinga River mouth 25 November. Salvaged and converted to a hulk, which was finally broken up in 1859. Port Elliot suffered several more wrecks this year: cutter Lapwing and schooner Swordfish were forced ashore during a storm early in September. Lapwing was destroyed in the surf and two crew drowned. Swordfish was refloated several days later with minor damage. Brig Harry was destroyed on the rocks at Port Elliot. The cargo of wool and lead was unloaded safely. Schooner Grenada was stranded at Port Willunga 21 June. Successfully refloated, several days later she was stranded again and dismantled. Barge Goulburn foundered in Hog Bay while under tow. Ship Phaeton, 1032 tons, arrived at Robe from Hong Kong on 1 February with general cargo and 260 Chinese bound for the Victorian gold fields. She was wrecked, with no loss of life. Only 200 chests of tea of the cargo were saved. Ship Sultana, again from Hong Kong with Chinese passengers and general cargo was wrecked on Cape Dombey near Robe. All crew and passengers were saved, but the wreck with all fittings and rigging, and the cargo was sold on the beach. The Dutch barque Koenig Willem II was also wrecked at Robe 30 June. She had brought Chinese passengers from Hong Kong and after landing them was awaiting suitable weather to sail. She was grounded in a strong gale, and became a total wreck almost immediately. 16 crewmen died attempting to reach shore. Manhou was en route to Robe from Hong Kong with 338 Chinese passengers, but called into St Vincent Gulf for food and water. 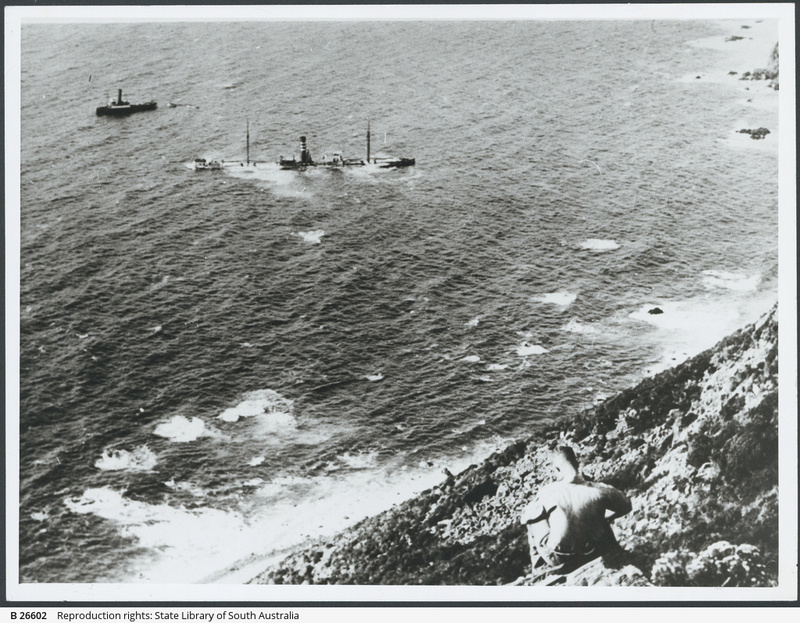 During a storm she ran onto a reef at Port Willunga 15 August, was subsequently refloated, repaired and sold. Discovered to need still further repairs, the new owners had her broken up. Several other vessels were stranded or wrecked at Port Willunga this year: brig Ida en route to eastern states from Port Adelaide, and brigantine Maid of the Valley. Remains of the Ida are exposed from time to time on the beach adjacent to the boat ramp at Port Willunga, the latest occasion being in late July 2009. Brig Halcyon was wrecked six miles south of the Murray Mouth, 14 November. No lives lost. Barque Verone reported lost west of Cape Banks. Schooner Rose was lost at sea between Black Point, Yorke Peninsula and Port Adelaide, 15 July. Heavily laden with wood she was believed to have sunk in heavy seas. Three lives lost. (Parsons Ketches of South Australia 5th ed. p 27). Cutter Venture was lost at Snapper Point, Kangaroo Island 14 September. No lives lost.